The New Richmond Exempted Village School District feels the best way to prevent conflict and confrontation with students is to defuse anxious, hostile, or violent behavior at the earliest possible stage. 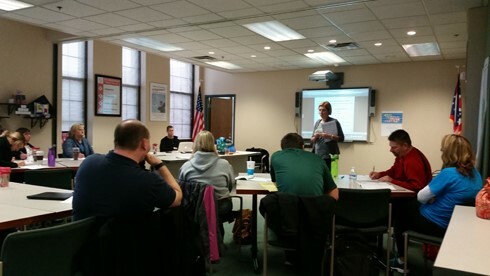 Recently, building teams from the five New Richmond district schools participated in Crisis Prevention Intervention Training given by Carrie Pugh, a psychologist and CPI trainer with the Clermont County Education Service Center, as part the Board of Education Policy that emphasizes limited use of restraint and seclusion in New Richmond Schools. Only professional and support staff members determined appropriate by Supt. Adam Bird, are permitted to physically restrain and/or seclude a student. “But only when there is an immediate risk of physical harm to the student and/or others; there is no other safe and effective intervention possible, and the physical restraint or seclusion is used in a manner that is age and developmentally appropriate and protects the safety of all children and adults at school,” noted Frye. The primary goal of the training is to reduce the risk of injury, comply with legislative mandates, meet regulatory/accreditation standards, minimize exposure to liability, and promote care, welfare, safety, and security.